Michigan students have gotten used to clearing out lockers during the first week of June with a long summer stretching lazily ahead. A post-Labor Day return to school is not only the norm, but the law. While many students spend the Mitten state’s precious sunny months experiencing sandy dunes and Great Lakes, camping and playing sports, many others don’t venture much further than their own backyards. That’s a big problem, educators say. Without time spent hitting the books, students slip back in reading levels and forget materials covered before break began. Research shows the learning loss, or summer slide, is especially evident among low-income students. According to information from the Maryland-based National Summer Learning Association, most students lose about two months of what they’ve learned in math over the summer, and low-income students also lose more than two months in reading achievement despite the fact that their middle-class peers make slight gains. Thornapple Kellogg superintendent Tom Enslen said teachers spend far too much time during the weeks of fall playing catch up. The long summer stretch is an old and outdated model, he said. “Given what we know to be true, it’s amazing we are still teaching with this model in twenty-first century education,” he said. But would shortening summer break help? Gov. Rick Snyder has voiced support for an incentive for schools to switch to balanced calendars with shorter summer recesses and more breaks throughout the school year. 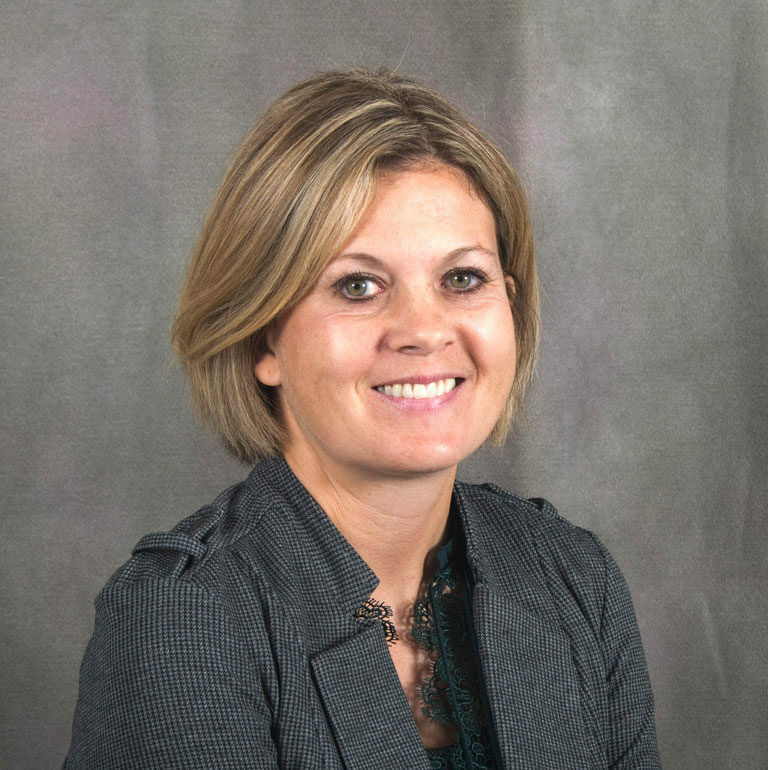 ButWest Michigan administrators have varying opinions on whether year-round schools will work for them because of costs of air conditioning and transportation, lack of parent support and poor attendance. Paradoxically, year-round calendar programs have been unsuccessful in local high-poverty schools where advocates say students would benefit the most. Grand Rapids Public Schools, which has a poverty rate of about 36 percent, according to U.S.. Census data, tried an alternative-calendar model with five elementary schools until problems at three of them led a switch back to the traditional schedule. 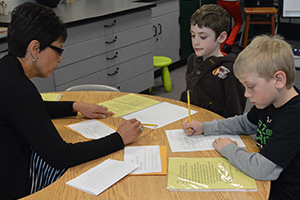 Emmons Lake Elementary School, in Caledonia, offers a balanced calendar. It opened in 1999, and has remained popular. Because the district doesn’t use traditional boundaries for school enrollment, every child attends by choice. Current enrollment is 446 kindergarten through fifth graders, and there is often a waiting list. The district’s poverty rate is about 7 percent, according to Census data. The district was allowed to continue the schedule since it began before Gov. Jennifer Granholm passed a bill mandating schools start after Labor Day to promote interstate tourism. Caledonia Superintendent Randy Rodriguez he’s glad the district offers the option, but he’s not considering a balanced calendar for the entire district. Emmons Lake students return after a seven-week summer break during the first week of August and have Fridays off throughout the month until a five-day week starts post Labor Day. They have weeks off called intercessions in October, February and April, and have holiday and spring breaks aligned with other schools. Parent Julie Asper, who has a third- and a fifth-grade student at Emmons Lake, said she loves the schedule. “It’s more of a gradual ease into school after summer. They come back and have four-day weeks. As far as I know there’s very little need for review. The pace of it is really nice. It’s less shocking then to come in after Labor Day,” she said. Parent Julie Remington, whose third grader started at Emmons Lake this school year, said she chose the school because of the calendar. She said her son looks forward to the more frequent breaks and is able to retain more of what he learns throughout the year. John Helmholdt, Grand Rapids Public Schools director of communications, said the district abandoned year-round calendars at Dickinson, Campus, Campau Park, Coit elementary schools, Creative Arts Academy, and GR Montessori K-8 schools. Logistic issues and poor attendance outweighed benefits, he said. The calendar worked well at Coit and Grand Rapids Montesorri, but academic performance declined at the other schools. Many students did not show up until after Labor Day regardless of the early school start and the schedule proved difficult for parents who needed childcare during breaks, he said. Wyoming Public Schools also switched Huntington Woods Elementary, launched in 1993 as a year-round school, back to a traditional calendar model because of budgetary reasons. Godfrey Lee Public Schools Superintendent Dave Britten said the school calendar isn’t the main problem causingstudents to fall behind. Urban poor districts with high percentages of non-native English-speaking students need a longer school year, upwards of 200 days versus the current 180 and the accompanying increase in instructional hours, he said. “It’s not simply ‘learning loss’ that urban, poor school districts wrestle with, but the fact that students are already behind and need more time to close the gap,” Britten said. 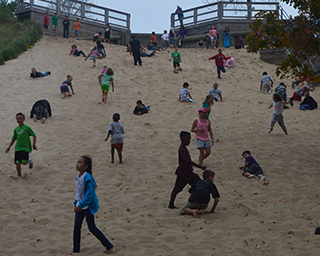 Also, experiential learning– like a day on the dunes offers– is very valuable, he said. “The experiential learning that occurs for more affluent students during summer breaks is missing entirely from the lives of poor children,” he said. According to information from the National Summer Learning Association, more than half of the achievement gap between lower- and higher-income youth can be explained by unequal access to summer learning opportunities. As a result, low-income youth are less likely to graduate from high school or enter college.